Patient specific disposable sliding aids for lateral transfers and patient repositioning. Flite Size: 30" x 77" 45" x 77" 60" x 77"
MaxiSlide Flites™ combine two proven concepts: MaxiSlide and Flites to create MaxiSlide Flites, the best disposable sliding aids for hygienic and efficient lateral transfers and patient repositioning. They are reusable, but intended for single patient use only. Costs associated with infections between patients and injuries to nursing staff can be reduced. And, as a disposable product, washing and laundry costs are eliminated. 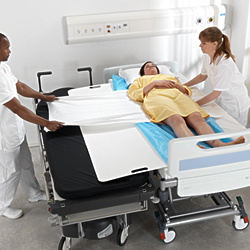 MaxiSlide Flites are a highly convenient solution that is always readily available at the point of use for nursing and care staff. No time is wasted looking for sliding aids. MaxiSlide Flites are made of a high-strength low-friction material. The slideability is equally excellent on both sides and in both directions. They are made from a biocompatibility tested, latex-free material and supplied in a user-friendly box for easy dispensing. The built-in, reinforced handles offer a comfortable grip, supporting safe and efficient handling routines, ensuring optimum ergonomic working techniques. The disposable pull straps can easily be attached to the sheets for lateral transfers preventing the carer from having to overreach. A tag where the patients name can be written and a green water dissolvable label can be found on each MaxiSlide Flite. The label dissolves when exposed to fluids. All MaxiSlide Flites are full bed length, there is no need to use an extension tube. The sheets come in three different widths and the tubes in two. MaxiSlide Flites are reusable, but intended for single patient use only. By minimising cross-infection risks, MaxiSlide Flites contributes to improved infection control. To ensure optimum hygiene right from the start, every sliding aid comes individually wrapped in a heat-sealed plastic bag. Designed to be extremely cost-effective, MaxiSlide Flites can be used as an integral element in policies for safe handling and to support effective infection control. It is an aid that can reduce costs associated with both injuries to nursing staff and cross-infection between patients. And, as a disposable product, washing and laundry costs are eliminated. This versatile sliding aid can be used to improve safety and efficiency in a range of handling situations. In addition to lateral transfers, it can be applied in a number of everyday tasks such as moving the patient up in bed, turning the patient, and the easy application of slings in bed. A convenient, cost-effective patient handling solution that combats cross-infections. Available in 30", 45" and 60" widths. All are 6'5" long. 11 sewn-in, reinforced handles with circle seam pattern to distribute force. Please note: By law, hygiene-related product cannot be returned. Due to this fact, we recommend that you discuss your specific needs with an Adaptive Living Representative or your personal healthcare professional(s) BEFORE purchasing any hygienic product. This item is a NON-RETURNABLE hygiene-related product.